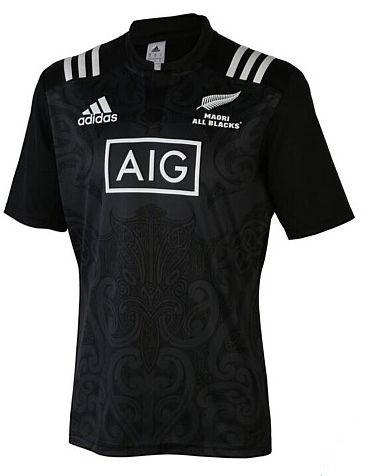 "The tāhuhukōrero for the design of the 2016/2017 jersey and the leisure wear is based on the atua TANGAROA. The selection of this theme allows for not only the graphic design elements but it is also a kaupapa that Luke has identified as suitable for development of the wider team environment particularly around team room set up and wananga topics. The kowhaiwhai patterns surrounding tangaroarepresent tidal flow, movement, strength, determination, power and speed. 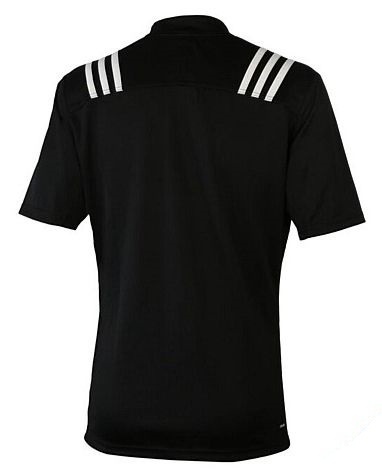 They also represent the style of free flowing rugby that the team are famous for playing. There are some quite specific detail and symbolism within the design. For example: a waka paddle will run through the manawa line and will flow in and through Tangaroa and become the arero (tongue) of Tangaroa. This symbolises rowing together in one direction with one heartbeat, unity, whanau and purpose. 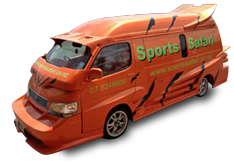 The cutting edge of the waves, swiftness, and agility. The carving design on the waka paddle represent koiri (to flourish). The background infill of the designs will represent scales and the scales link back to the central theme of Tangaroa and the things that reside in his domain - such as Mangopare, Makoand Mangotipi.